Art, Collaborators, Estel, Friends, Purchase ESTEL stuff. 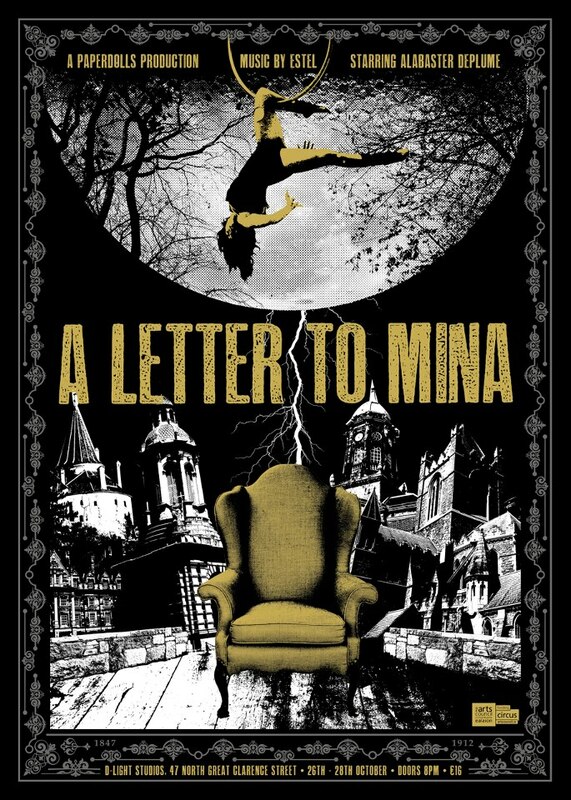 At last, the beautiful poster for ‘A Letter to Mina’ designed by Gav Beattie from Tiny Little Horse printing. A2 prints are available to buy. PaperDolls meet Bram Stoker in a Victorian inspired exploration of the female and the monstrous. Featuring performance and writing by Alabaster DePlume, an original score by the darlings of Dublin’s alternative music scene Estel, and a diverse display of talent and skill from Dublin’s rogue cabaret and subterranean theatre culture, PaperDolls performance company are creating a Gothic theatrical playground of ideas and physicality, for three nights only in the ever malleable D-Light Studios. An engrossing visual feast, this site specific performance incorporates new writing, original music, aerial, circus skills, suspension and theatrics. A Letter to Mina is an immersive and site specific performative adventure which oscillates between beauty and disgust.